Hampers Cognitive Development: Your baby’s brain grows at a rapid step from the time they are born. Research has shown that overuse of these gadgets results in slow cognitive development, attention deficit and even damage hearing. So from the time they learn to speak first few words, the only person reading, singing songs and nursery rhymes and talking to them should be you and not some artificial character over a gadget. Builds Obsession Leading to Agitation: What begins as an odd way to pacify them soon turns into an obsession leading to dependency. This obsession can lead to increased agitation and temper management issue. If you don’t want an agitated toddler spend quality time with family, limit the extent of use to electronic gadgets before your toddler gets too attached to them. Delayed Physical Development: kids should be playing, jumping, running, hopping, skipping or playing with other peers. All items of interest which stimulate all the senses like hot, cold, soft, hard, white, black, red, blue, green, yellow. Being stick to these gadgets may result in no physical development in your child. Abnormal Social Behaviour: If children are very attached to the gadgets, they spend their whole time with them, losing social interactions and friends. More use of gadgets may lead to akward social behaviour. Reduced Focus/concentration: Most of the children spend their time watching tv, playing video games, playing online games and spending lot of time on the internet reducing their focus. A strain on the Eyes: Electronic devices causes eye problems in children. The bright light of the screens leads to a confusion of the brain to understand sunlight vide bright light to no dark night absence of light, leading to insomnias in children. Overuse of gadgets can dry the liquid in eyes causing the eye infection and vision affection may also occur. The blue light emitted from the gadget's display prevents the release of melatonin hormone that plays a vital role in sleep. Cause the Neck & Back Pain: Continuous use of gadgets causes back pain and other muscle related issues. Neck and backaches at a young age are very harmful to kids since they tend to affect the position of the child for a lifetime, if not looked after on time. How to prevent children from gadgets? Children will always follow actions of their parents. 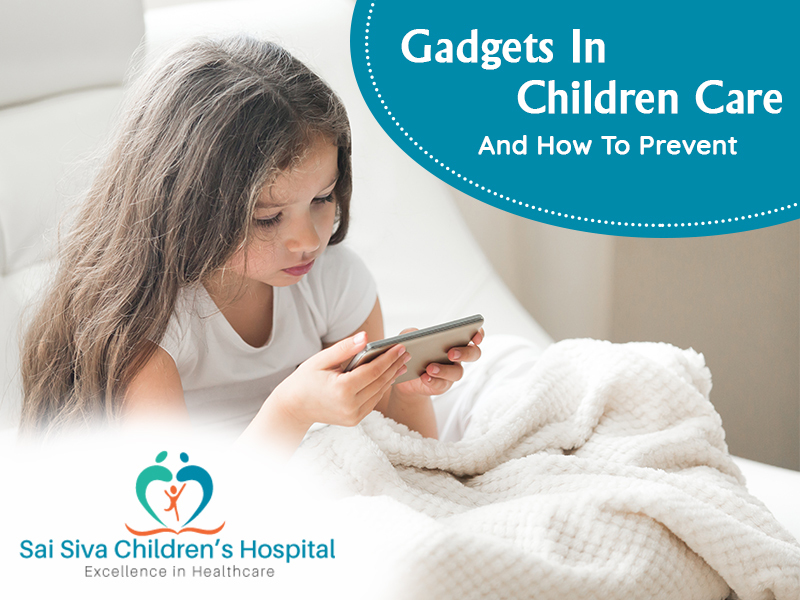 Some simple tips can help you avoid the usage of gadgets in children. As a responsible parent, maintain strict rules towards the use of gadgets. You need to secure that your child has a healthy life and healthy habits. Make strong decisions and put your foot down by limiting unhealthy habits like too much TV/computer time, no matter the beg and cajoling. If you set a strong password to your gadgets like tablets, smartphones etc. your children cannot open your gadgets. They do their own works such as playing with friends, reading, writing, drawing and most probably they spend time most of their time with you. Allot a suitable amount of screen time for your child, ignoring the gadget. Hand your child the option to watch TV, use the computer, etc. and let him/her select what time of the day he/she wants to use the gadgets. This gives them a sense of freedom and requires him/her in building decisions too. To avoid the gadget addiction, it is important to use different assets within your child’s extend that anger their interest. Demand your child to improve activities like read-aloud sessions, sports sessions, board games, art and craft time, etc. Kids who spend a lot of alone time are more likely to get attached/addicted to gadgets. So, try to spend more time with your kids and do things that interest them from playing with dolls to playing hide and seek. It might take completely a lot of effort on your end but it is sure that your efforts pay off. It is easy to hand your child a cellphone or turn on the TV to keep him occupied and get your own work done. However, the little object matter more than you think after a point these gadgets might become an addiction that diverts your child from other activities Instead, be involved, ask what they want to do and listen to what they have to say. Try and apply the help of your partner, parents, or paid help when needed. Playing outdoor games will help her/him learn to play with other kids. At the same time, it also helps them build their gross motor skills when she/he runs around the ground and indulges in some outdoor play. Plan gadget free vacations, picnics.